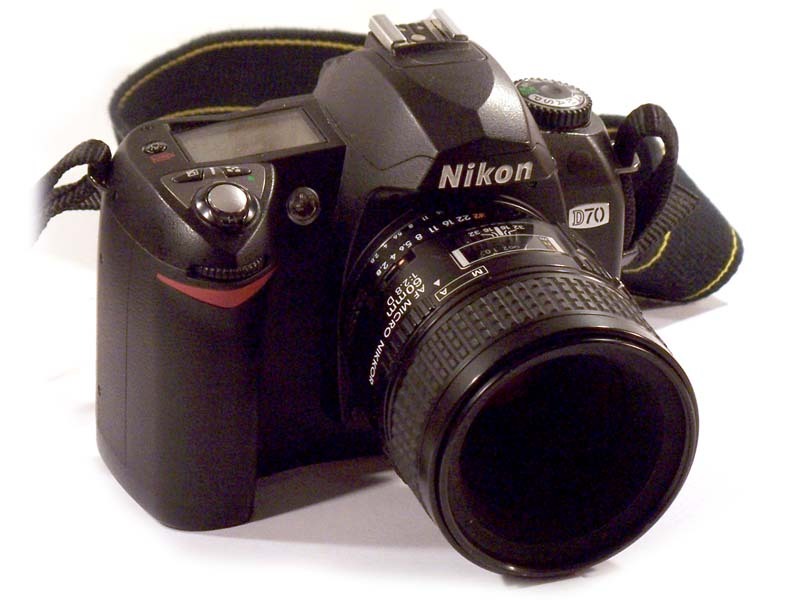 I wanted this camera mainly to use with my existing stock of Nikon lenses. When I went in to Newtonville Camera to buy it, I was persuaded to get the stock 18-70 zoom lens as well, because it would work with all of the camera's features, unlike my older lenses. As it turned out, this was very good advice. The most startling thing about this camera is how fast it focusses and responds...much faster than any other autofocus camera I've ever used, film or digital. The older lenses work, but only two of my older lenses, the autofocus Sigma 24 and Nikkor 28-85 zoom actually couple to the camera in a useful way. My older lenses work in manual mode only, without even any light meter functionality. I still use these when I need the faster glass of an f1.4 or f1.8, but mostly I use the newer lenses. I bought two newer lenses afterward to go with the D70: a 70-300 zoom and a 60 mm Macro lens. Most of the photos of cameras on my "My Cameras page were taken with the macro, using bounce flash from the SB800 strobe.